[General description] Harris Scarfe's four storey building has arched windows on its upper floors and a cantilever verandah over the footpath. 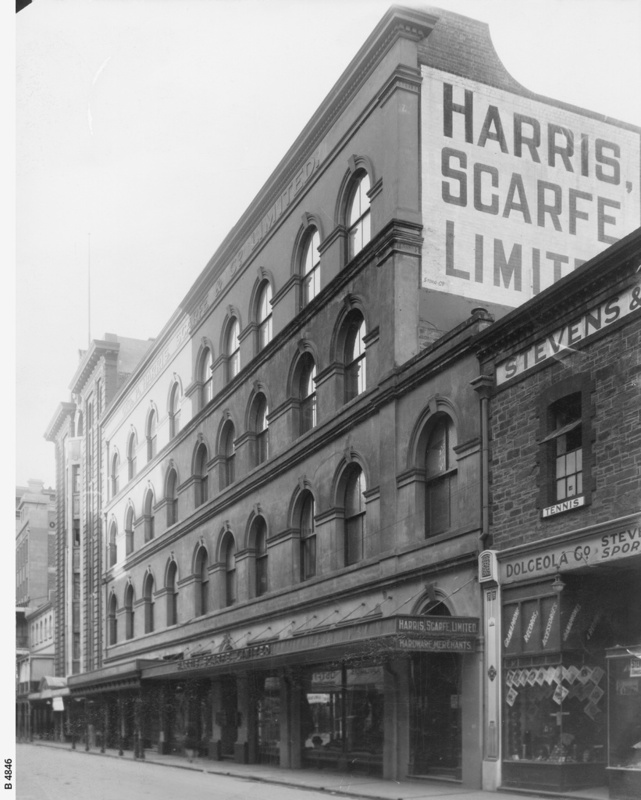 The name 'Harris, Scarfe Limited' is painted on the side of the building in large letters. Next door on the left is the new Claridge Building. [On back of photograph] 'Acres 105 and 82 / Gawler Place, east side looking north from a point near Grenfell Street / 1928' (Another hand) 'Boundary between Harris Scarfe's and the Dolceola Co. is 47 yards north of Grenfell Street / Far side of Harris Scarfe's is 53 1/2 yards south of Rundle Street' (Another hand) 'In 1934 portion of Harris Scarfe's was demolished (Compare with B 6785). The portion demolished is covered by the arched windows 5,6, and 7 (counting from the left)' (Another hand) ' In 1938 the portion occupied by the arched windows 8 and 9 (counting from the left) was remodelled. Compare with B 8206'.